(Bloomberg) -- The defensive tone to Monday’s action following less-than-desired results from key banking names never became concerning enough, as the psychologically important 2,900 level mostly held firm. And for today, Bank of America results just hit the tape and are providing a slight lift after beating on most metrics -- providing just enough positive sentiment investors can use to allay any of yesterday’s concerns. But what’s dominating today’s action early is the overarching dovish tone from central banks worldwide. It’s almost as though they sensed key benchmarks around the globe were poised to reach out and touch all-time highs -- and needed that last little push to get over the hump -- though they’d never admit that of course. Japan, Australia and New Zealand officials all voiced a preference for easing, and that’s not even getting to commentary from the ECB’s Villeroy and the Fed’s Evans, who also both expressed a willingness to keep rates low. That and the VIX index continued its descent, reaching levels not seen since October, showing investors are at some sort of peace where things stand. Goldman Sachs analysts ascribe this decline to low macro volatility and falling realized vol. But they do caution that the recent uptick on VIX options implied volatility is a “reminder that conditions can change quickly” for equity markets, and with diminished liquidity, this is enhanced. So one must wonder, that with earnings on the docket from major players like Netflix and IBM, will they even matter as stimulus is maintained? Remember, with Netflix’s results, it will cover a period before the latest price increases, though the phasing in process will be top of mind for investors after key competitors like Disney have entered the fray. Shares of Roku will be closely watched for read-through as its among the most exposed, but may also be a beneficiary from any potential blowout from the streaming service provider. And remember that $33 billion opportunity that presented itself with IBM’s deal for Red Hat? Earnings from big blue are due after the bell as well, but that $33 billion opportunity will surely set up for confusion, as results may be far from indicative of the overall tech sentiment. The Fed overhang still drives the greater cyclical and growth space, but a key detail to look for in the release is how the market for the "hybrid cloud" is developing. The deal isn’t set to close until the second half but that uncertainty is sure to cap excessive volatility, or at least any follow-through to the greater S5INFT which is the best performer of 2019. When looking at one of the worst performers, the healthcare segment, not all names are created equal. Small caps are outperforming, as Credit Suisse strategists highlight in their discussion of how fundamentals in the segment remain strong. Life sciences names are among the strongest but are also among the most expensive, the strategists add. But there’s a deeper reason why this disparity has occurred and why investors have failed to reward the segment. More on that below. After better-than-expected results and a raised outlook from UnitedHealth Group Inc., (shares are up about 2.5 percent in the pre-market) investors will stay glued to their phones for the company’s earnings call at 8:45am to seek clues on the policy outlook in Washington D.C. SVB Leerink analyst Ana Gupte, who has the highest price target on the stock, looks to the company to soothe investor nerves about the $482 billion sector that has seen some of the most turbulent couple of months of the last decade. A benchmark for health insurance stocks is down 15 percent since mid-February as investors capitulated to policy risks in Washington D.C. that threaten a new period of uncertainty for a sector that has known nothing but substantial gains for several years. 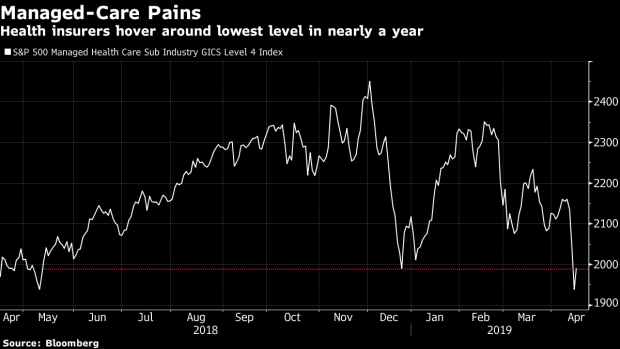 Several providers have now seen the spread between their stock prices and the average analyst price target widen to the highest levels in at least 15 years over the past month, according to data compiled by Bloomberg. Bulls are looking for investors to go back to fundamentals, which "should reign supreme for at least the next month or so" until the Democratic presidential primary debates start in June, Evercore analyst Ross Muken wrote in a note last week. "We expect 2019 to be another year of beat & raises," he said. Besides politics, M&A is also likely to find its way into earnings call Q&As. Cowen analyst Charles Rhyee stirred the pot last week, suggesting that Humana Inc. could make a bid for Centene Corp. or Molina Healthcare Inc. Separately, RBC removed BP Plc from its list of top picks, seeing less upside potential following a recent advance in the stock. However, it kept an outperform rating on the stock, citing its medium-term growth profile and cash flow framework. For Helius, the downgrade comes after a dramatic slump in the stock, including a 66% plummet last week that came in the wake of the FDA declining De Novo classification and 510(k) clearance of the company’s Portable Neuromodulation Stimulator device. BTIG wrote that the FDA’s “binary decision” had been key, and that the negative outcome “is likely to derail the stock for some time.” It urged the company to host a call with investors, saying that “without knowing company plans, it is impossible to evaluate” the company’s potential. That said, it added, “we do believe significant dilution may be necessary." Morgan Stanley issued something of a mea culpa on Snap, writing that "we have been wrong" about the company, pointing to a surge of nearly 140% in the stock since a December low. The firm boosted its price target from $5.50 to $8.50, though the new view still implies downside of about 30%. Analyst Brian Nowak wrote that some of Snap’s 2019 rally was "warranted" as it is "seeing green shoots in advertising (i.e. Commercials ad unit), improvements in engagement and innovation... and a more stable user base (that now must grow)." However, the firm kept its underweight rating on the stock, saying "we likely need even stronger fundamental results (than our new numbers) to drive material outperformance from here." --With assistance from Ryan Vlastelica and Tatiana Darie.